For the first time ever, after decades of research, the story of Louisville's street railways and their impact on the city is told in detail, supplemented by several hundred photos, drawings, and illustrations, and 14 large-scale maps of the railway lines and routes. This unique coffee-table book showcases hundreds of vintage, full-color postcards that were sold at the local drugstores, dry goods establishments, and country stores of Kentucky in the early 1900s. The images give a panoramic, front-row seat into the Bluegrass State and America of a bygone era, invoking the people, places, and events from a remarkable period in the state's history. From a scandalous double murder involving a prominent Kentucky family to the story of a forgotten soldier, Riverside: The Unfolding Story reveals the compelling history of a 300-acre Ohio River farm in southwest Louisville. Published for the 25th anniversary of Riverside's opening, this book explores the fascinating story of a place that embraces ongoing research and public engagement. Author David Williams uncovers a wealth of stories about the Old Louisville neighborhood — its more colorful residents, its notorious scandals and murders, its hidden treasures and forgotten lore — which no other book has explored. Along the way, he punctures a few urban legends that until now have been taken for granted. Filled with historic and contemporary photographs. Rich, flawed and female, Louise Marshall was an unconventional hero, focusing her life on one Louisville, Kentucky neighborhood, known as the Cabbage Patch, and the individuals who lived there. For 70 years, she used love, not legislation, to foster pride, self-respect, and character in people, and to attack the day's most difficult social problems. In 2017, Louisville Ballet celebrates its 65th Anniversary. Follow the history of the fourth-oldest professional ballet company in the United States, as told through hundreds of photographs and engaging narrative. The Elsby, built in 1916 on the corner of Pearl and State Streets, was New Albany, Indiana's first high-rise office complex. It was a testimonial to the art of ingenuity and innovation, incorporating the most modern conveniences available at the time. In 1917, the New Albany Public Press declared, "Everyone admires the new Elsby." But who was this man, Samuel J. Elsby, who built it? This book dives into the history of both the man and the building, which Elsby considered his crowning achievement. On New Year’s Day 1886, the Norton Memorial Infirmary School of Nursing — the first nursing school in Kentucky — opened its doors in Louisville. Over the next 90 years, more than 1,500 young people prepared for careers as registered nurses. This book, compiled by four Norton graduates, takes the reader through major historical events, medical advances, vast cultural changes, and the evolution of the school. When you grow up in the country, family is everything. Bessie Jones Elliott felt very strongly about her family and her home in Kentucky. Even during tough times in her life, she always held her family together … and they stayed together. This book of memories was written by Bessie's daughter, Sharrie A. McWhirter, who hopes this book gives readers an opportunity to experience her mother's memories — the good, the bad, the funny and the sad — of what it was like to live in the country as a "moonshiner's daughter." Dark Highway is the true story of a well-liked and beautiful widow, a powerful state politician, and two murders that shocked Kentucky and received international attention in 1936 and 1937. Kentucky attorney Ann DAngelo spent six years researching the case to craft this haunting tale of love, murder, and revenge. Author Neal O. Hammon precisely details the route that pioneer Daniel Boone took to carve a route through the Kentucky wilderness for land-seekers. Hammon touches on interesting stories, the successes and failures, and the unintended consequences of Boone's journey — for which we all are richer. In the words of Richard Taylor, former Kentucky Poet Laureate, "Hammon's meticulous, stubborn research makes him the dean of living Kentucky frontier historians." 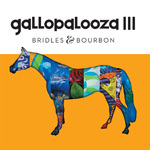 After the success of Gallopalooza, Louisville's Sidewalk Derby, and Gallopalooza, The Horses of Possibility City, Gallopalooza III was launched in 2015 with a theme of "Bridles & Bourbon." Six-foot-tall mint julep cups and smaller horses balancing on bourbon barrels have now been added to the much-loved traditional horse statues on display around the city of Louisville. This is the third volume in the colorful set of commemorative books produced to capture the images and the spirit of Louisville's popular and highly successful public art program. This full-color hardcover volume showcases an extensive collection of vintage postcards assembled over the last 35 years by Kentucky native Carl Howell. The images, along with detailed narratives Howell has written about the postcards and what they depict, provide rare and intriguing insight into the lives of ordinary Kentuckians in the early 20th century. Viewed in their entirety, they reveal a panorama of subjects that shows who we were, what we valued, and what we accomplished. Steve Flairty's fourth collection of well-told stories recognizing the most important — not the most famous — people in our beloved Kentucky. These stories about real members of our statewide community will warm your heart, inspire you, and just generally make you feel more positive about the human condition. Author Sue Ballard provides a thoroughly researched, fictionalized autobiography of frontiersman Daniel Boone's wife, Rebecca Bryan Boone, a woman who deserves tribute for her role in carving new homes and new lives in the primitive and dangerous Kentucky wilderness. Ballard's description of Rebecca's day-to-day life is accurate in each detail, from raising their many children, farming, and kitchen work, to her hourly prayers and waiting in loneliness for the return of her trailblazing husband. A must-read for all who love early American and Kentucky history. This beautiful keepsake volume tells the story of Actors Theatre, from its humble beginnings in a rough and tumble loft space on Fourth Street to its growth into one of the most important regional theatre companies in America today. Celebrating 50 years of creative accomplishments, this limited-edition book offers a graphic timeline packed with colorful anecdotes of the people who lived it and the community that embraced it, and is punctuated by hundreds of photographs of the most fascinating and memorable aspects of Actors Theatre's history — the productions themselves. Dedicated to preserving the history of the Bluegrass State's most beloved spirit, author Chester Zoeller introduces readers to some of the outstanding gentlemen who became involved in whiskey distilling at the turn of the 20th century in and around Kentucky. He also takes us back to the last years of the 1800s, when hundreds of distilleries produced a wide spectrum of whiskies — Bourbons, both sweet and sour mash, rye, and multi-grain whiskies — and the medicinal benefits of these delightful drinks were as endorsed as their taste. This nostalgic book collects a variety of stories, interviews, and photographs from September 3, 1964, the day the Beatles performed to over 30,000 fans at two shows during the Indiana State Fair. Will surely evoke fond memories in those who will never forget that memorable visit over 50 years ago. This full-color history book tells, for the first time, the compelling story of the first and only U.S. Life-Saving Service and Coast Guard station, and the remarkable crews who saved thousands of lives, countless numbers of boats, and millions of dollars of cargoes at the Falls of the Ohio from 1882 until 1972, before the days of the modern lock and dam system. Recalling how a system of volunteer "girl chauffeurs" facilitated the American Committee for Devastated France after World War I, Mary Breckinridge developed a similar plan for the Frontier Nursing Service, a nursing center and midwifery in the mountains of eastern Kentucky since 1925. This is the wildly successful and diverse history of the Courier Service. Louisville, Kentucky's recent history has no more unforgettable moment than April 3, 1974 — the day a disastrous tornado tore a path of destruction across the city of Louisville and its metro area. This new softcover edition commemorates the 40th anniversary of that fateful day in Louisville's history. Inspired by her mother's and grandmother's family stories, Joanna Thompson Buckman shares warm reminiscences of what her mother's life was like growing up on a farm in central Kentucky. Former judge Sid Easley rescues the true tale of Sheriff John T. Roach's murder by his friend and fellow deputy Sam Galloway from obscurity, and illuminates the circumstances and personalities behind this dramatic story that shook a small Western Kentucky town. David Inman grew up watching too much TV and, for better or worse, remembering most of it. Now 32 years after he began putting this expertise to good use as the nationally-syndicated newspaper columnist of TV and film trivia, "The Incredible Inman" has compiled the very best trivia and his most memorable answers about TV shows, movies, and related weirdness into one incredible book. This biography chronicles the life of Eula Hall, an iconoclastic woman with a resolute spirit to help her people. Through moonshining, labor strikes, and eventually creating the Mud Creek Clinic, Eula found herself — through sheer determination and will — at the center of a century-long struggle to lift up a part of America that is too often forgotten. The first official surveys west of the Appalachian mountains were made in 1774 by John Floyd, a 24-year-old Deputy Surveyor of Fincastle County, Virginia. Over the next nine years, Floyd surveyed 206,000 acres, became a civic leader in a central Kentucky settlement, and carried on continuous correspondence that gives today's readers a window into frontier life that is informative, authoritative, and insightful. This is an important and neglected source that adds to our understanding of this critical period in the formation of what was to become the Commonwealth of Kentucky. As the premier cemetery in the geographically central location of Louisville, Kentucky, during the Civil War, Cave Hill Cemetery had many connections to both the Union and Confederacy — and was, therefore, an ideal place to bury both high-ranking officers and ordinary citizens. In this clear and easy-to-use guidebook, author Bryan Bush gives the well-researched history of the cemetery's role in the Civil War, complete with detailed cemetery maps, photographs, and stories from the Civil War. This is the story of Kentucky Refugee Ministries, a resettlement agency based in Louisville and Lexington, Kentucky, where human beings who have come out of conflict and deprivation create new lives of accomplishment. Since its founding in 1990, KRM has welcomed more than 12,000 humans from more than 40 countries across the globe and helped them start new lives. It continues its work to this day. Author Bobbie Smith Bryant's full-color hardcover volume offers a rich and colorful collection of over 200 family recipes, hand-crafted heirloom quilts, and delightful stories celebrating the unique traditions of her family, its farm, and the "Black Patch" region the Smiths have called home for many generations. Nelson County, Kentucky, which includes the city of Bardstown, suffered more battle deaths per population in the Vietnam War than any other county in America. In this book, co-authors Harry Spalding and Don Parrish share the service records and stories of many brave Nelson County citizens who served valiantly in all branches of the military during the Vietnam War. As the first book devoted to Kentucky wine and its wineries, this full-color volume takes readers on a tour of Kentucky to visit thirty-four of the state's wineries, to explore the history of wine in Kentucky, and to discover the grape varieties that make their favorite wines so enjoyable. It's "a five-star guide to Kentucky wines for everyone from the amateur socialite to the most avid wine enthusiast." As a journalist of the "old school" who believes everyone has a story worth telling, Barry Bernson has endeared himself to TV audiences in Louisville and Chicago by focusing on the "little guy" and the human comedy: the extraordinary lives of ordinary people. Here, Bernson reveals the warm, often-hilarious account of a life spent in modern broadcast news. Founded in 1925, the Frontier Nursing University has held steadfast and powerful roots in the mountains of Eastern Kentucky, yielding a bevy of both healthy babies and quality nurse-midwifery graduates for over 85 years. In this coffee-table volume, the stories and experiences of the early Frontier graduates provide a fascinating glimpse into an otherwise undocumented history of nurse-midwifery in the 20th century. Back in print! As the official recorder of all Seelbach legend and history, author Larry Johnson discusses in lively detail the many celebrities, presidents, movie stars, famous writers, gangsters and even ghosts who've passed through this bastion of stately architecture in Louisville, Kentucky. With over 300 contemporary and archival illustrations, this beautiful full-color coffee-table book presents an in-depth view of 32 spectacular country estates in Louisville, Kentucky, and the families and architects who built them. This period and genre of residential architecture and related social history in Louisville have never before been documented this thoroughly or extensively. In this tell-all book revealing the news behind the news, veteran Emmy-award-winning TV news anchor John Boel shares 25 years of fascinating stories from one side of the camera, then takes readers to the other side, telling the whole story of his powerful journey through the public shame of two high-profile DUI arrests and his gradual recovery and self-discovery. Kadie Engstrom's full-color volume reveals the many places a visitor can go to learn about the wonderfully vast history of Louisville, Kentucky's metropolitan area. Along with retelling significant events in local history, Engstrom targets the sites (including those designated as National Historic Landmarks) that are available for visitation and which interpret a piece of Louisville's historic puzzle. Praised for its innovative landscape design, Louisville's Waterfront Park was, just 25 years ago, covered by an industrial brownfield wasteland of scrapyards, sand and gravel operations, warehouses, asphalt plants and railroad tracks. This beautiful full-color coffee table book tells the great success story of the Park's transformation and how the vision was achieved. Over two centuries and more, African Americans in Louisville, Kentucky have created a community and defined its identity and character while meeting the evolving challenges of slavery, freedom, segregation, politics, economics and cultural meaning. Presenting over 450 historical and archival photographs, this beautiful book tells the story of this community in words and images. Esteemed philanthropist Isaac Wolfe Bernheim's most enduring legacy is the 14,500-acre Bernheim Arboretum and Research Forest in Clermont, KY. After 80 years, his dream of creating a place to "gladden the soul and please the sight" has long been realized, with thousands of annual visitors finding inspiration in the forest's miles of trails, formal gardens, visitor center, events and all facets of wild land. Here, for the first time and in 280 gorgeous, full-color pages, the story of the forest and the man behind it unfolds. As Louisville Water Company celebrates its 150th anniversary, this keepsake coffee-table book explores the company's complete history through historic photographs and rich stories from the company's archives. Since 1860, Louisville Water Company has pioneered research into cleaning drinking water, built landmark structures and become a life-line for the city's population. It provided street "sprinklers" in the 1800s, a swimming pool in the 1920s, a silent movie in the 1930s and a "victory garden" in the 1940s. Here you'll discover how Louisville's history has been shaped by the history of its water works. Filled with memories, music and memorabilia from the era, and packaged with a commemorative DVD documenting the band's history, this book takes readers back to the early days of Louisville rock 'n' roll to remember one of its biggest acts, The Monarchs. After 50 years of concerts, sock hops, dances and reunions, the music hasn't stopped, and award-winning journalist Billy Reed follows the band—and the greater Louisville area—through it all. A true labor of love, bourbon aficionado Chet Zoeller conducted years of research to uncover the complete history of bourbon distilling and distilleries throughout Kentucky. Bourbon in Kentucky is the comprehensive publication of his findings, cataloging almost 1,000 distillers and brands across the Commonwealth—from farmhouse mashers to the major industrial concerns, and from the late 1700s to the present day. With hundreds of rare and historical photographs, this is believed to be the first and only authoritative history of its kind. From proud but humble beginnings in Happy Hollow, Kentucky, bourbon producer Maker's Mark has grown to cult status around the world. In My Autobiography, the company's flamboyant president, Bill Samuels, Jr., gives us the official, fascinating and colorful life story of his family's premier bourbon brand. With hundreds of color photographs, this beautiful 150th Anniversary book celebrates the history of the American Printing House for the Blind—which is based in Louisville, Kentucky—and examines the mechanical innovations and evolutions, right up to today's digital solutions, that have enabled them to provide specialized materials, books, products, and services to the visually impaired. Beginning with bands of hunters and gatherers foraging for food, join revered archaeologist Donald Janzen on a 10,000-year journey to explore prehistoric Native American life in the Falls of the Ohio River region. With a variety of illustrations and artifacts, Unearthing the Past provides compelling revelations about what lies beneath the streets and subdivisions of our 21st century hometown. His name evokes images of timelessly handsome, classically beautiful homes that remain highly sought-after many decades after their construction. In this magnificent volume, the authors present a comprehensive appreciation of Hammon's work through gorgeous photography and full description. This book was awarded a Bronze Medal for Excellence in the national Architecture category of the 2008 Independent Publisher Book Awards. This complete yet purse-sized volume is the perfect guidebook to Louisville's most significant buildings, historic residences and landmarks, incorporating the dates, the architects, and the style, significance and historic status of over 60 of Louisville's most notable sites. Through historic photographs, maps, log books, diaries and recollections, Rick Bell re-creates, in thrilling detail, the magnitude of Louisville's worst natural disaster which, 70 years ago, put two-thirds of the city under water. To celebrate the history of one of Louisville's oldest and most vital Catholic parishes, Father Jerry Eifler and Steve Wiser have created a lively and thorough look back at the people and milestone events in the church's development and evolution, by weaving personal memories with hundreds of archival photos along with the original research of Charles W. Beckman, Sr.
Spanning over 120 years of the school's history, this book captures the essence of what it means to be a "Mercy girl." The history, faith and educational mission of Mercy Academy are documented here in words, archival photographs and contemporary images. You never knew Louisville was so well-connected! In this fun and surprising compilation, Louisville's chief trivia expert tests your knowledge of the many connections between Louisville and the worlds of film, art, music and literature.